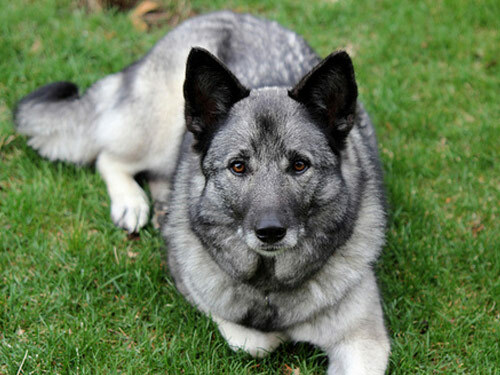 The breed of the Norwegian Elkhound is quite similar to that of the Spitz family of canines. They are very alive and fun dogs with a love for colder climates. They do have a lot of energy and will adore using their adventurous sprits to get into a game with their families and can be well mannered with little ones. Strangers will not scare this dog and they may be even friendly toward them, however, around strange dogs they do not know they can be a tad aggressive and unruly around. They do just fine around other family pets and love being a watchdog and protector of their families. It is very important to train this breed as pups so they can learn to walk on a leash without any challenges as trying to train them to do so at a later time in their lives, may cause a struggle. The Norwegian Elkhound is a natural born hunter. They do bode a great deal of energy which those needs can be met by playing outdoors for awhile, through a long walk on a leash or even running with their owners. With their thick fur coats, they can easily adapt to colder climates and eve reside in them, but it is most comfortable when it can live indoors and play outside as its leisure. Their fur will need grooming a few times per week by a simple brushing to keep it from becoming matted. When the shedding season begins, it will need a bit more grooming to rid of lose, dead hairs. As far as major health issues that the Norwegian Elkhound can develop, the most commonly seen ailment is CHD. Some minor ailments can be hot spots, kidney disease or renal Dysplasia and sebaceous cysts. In rare occasions, they can be seen for PRA, patellar luxation, Fanconi syndrome and intracutaneous cornifying epithelioma. The vet many recommend screening for their eyesight, hips and urine testing. The average lifespan for a Norwegian Elkhound is from ten to twelve years long in good health. They generally weigh forty eight to fifty five pounds as full grown dogs, with the males being slightly larger in size. The Norwegian Elkhound resembles the other canines in the Spitz family, but it has exceptional hunting abilities that make it stand out from the rest of the scent hounds. Most scent hounds can hunt small game and trail easily, while this breed can hunt much larger game such as moose and even bear. They have been popular as very useful hunting dogs dating all the back to Viking ages. This breed is also notorious for being able to survive in the coldest of climates and still provide herding and hunting duties with ease. The Elkhounds come in two variations with the bandhund being skilled at tracking scents alongside their hunter owners and the loshund being the animal that can track in front of their hunter owners. They alert the hunter by barking when a moose is nearby and has the ability to completely avoid any injuries by the antlers of the moose prey. They have been used in dog shows in America and are still a popular pet there and in Scandinavia.